An 8.40 mile segment of Interstate 181 remained posted from I-81 north to Kingsport, Tennessee until 2007. Interstate 181 was the designation applied to the U.S. 23 freeway through the Tri-cities area of northeastern Tennessee. The winding freeway bisects Johnson City along an urban route as it leads north from U.S. 321 to Gray and Interstate 81. 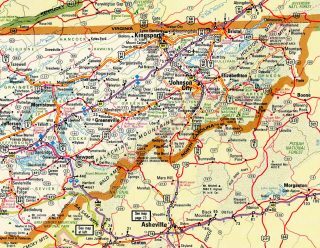 The northern section of I-181 took a more rural route across a series of ridges south of Kingsport and over eastern reaches of Bays and Holston River Mountains. The interstate portion of U.S. 23 ended at U.S. 11W at Fort Robinson in north Kingsport. The U.S. 23 / Interstate 181 freeway was constructed in stages during the 1970s and 1980s as part of the project to construct Appalachian Development Corridor B (U.S. 23). I-181 was established along the route by AASHTO on June 9, 1986. With the extension of Interstate 26 north from Asheville on August 5, 2003, the section of Interstate 181 south of I-81 was eliminated. This reduced the interstate spur from 23.85 miles to 8.40 miles between I-81 and U.S. 11W (West Stone Drive). A rejected proposal in June 2003 also called for renumbering what was left of I-181 as new Interstate 126. Signs for Interstate 181 were completely removed in March 2007, with the remnant mileage incorporated into Interstate 26.2 Exit numbers were renumbered so that the sequence counted upwards as one traveled south from the Virginia state line instead of the previous scheme using the mileage of U.S. 23 north from the Tar Heel State. 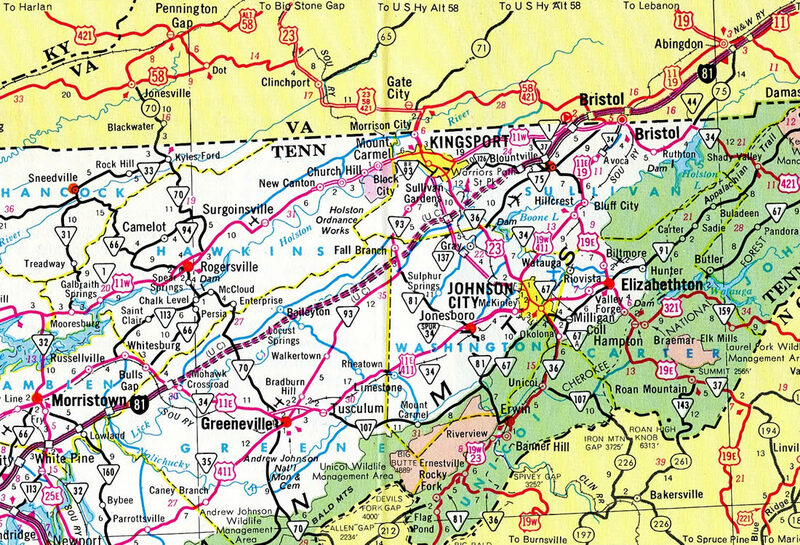 The freeway linking Johnson City and Kingsport in the Tri-Cities Area was initially designated Tennessee 137. It ran north to what is now Tennessee 126 at Exit 4. 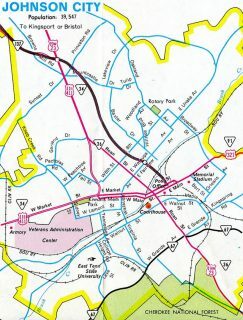 The Tennessee 137 freeway was extended southward from U.S. 11E (Roan Street) to Market Street by Downtown Johnson City between 1973 and 1976. U.S. 19W and 23 would shift onto the freeway by 1978. 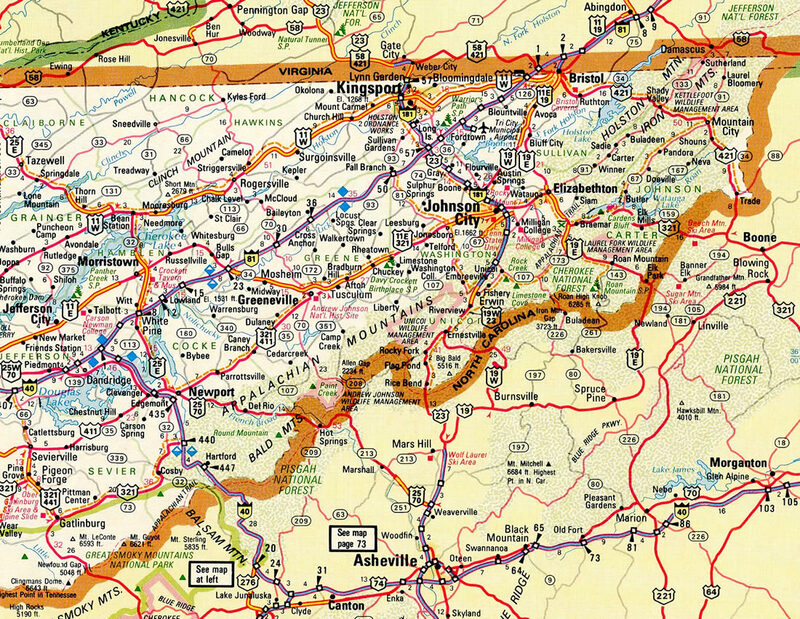 Interstate 181 debuted on the Rand McNally North American Road Atlas in the 1987 edition. Interstate 181 & U.S. 23 made a gradual descent from the north slope of Holston River Mountain to cross the South Fork of the Holston River. A long viaduct takes the freeway north to U.S. 11W, which was Exit 55 when I-181 was still designated, and is now Exit 1 of I-26. Photo taken 08/23/03. The six-ramp parclo interchange with U.S. 11W (West Stone Drive) represented the north end of I-181, with U.S. 23 extending northward to Gate City, Virginia. U.S. 11W comprises a divided arterial highway east around Kingsport to its terminus in Bristol. Photo taken 08/23/03. U.S. 23 veers southwest from its former alignment at Morrison City to traverse Bell Ridge on the approach to U.S. 11W (West Stone Drive) and the original north end of Interstate 181. Photo taken by Chris Patriarca (04/03). Old Exit 55 departed from U.S. 23 south for U.S. 11W (West Stone Drive) at Fort Robinson. Interstate 181 began here, but signs were not posted until the viaduct across the South Fork of the Holston River and Long Island. Photo taken by Chris Patriarca (04/03). U.S. 11W (West Stone Drive) south at the loop ramp for historic Interstate 181 and U.S. 23 south to Johnson City. 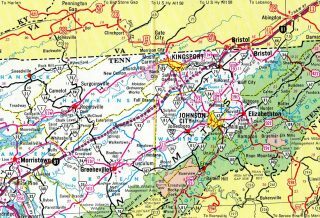 U.S. 11W continues southwestward 85 miles to Knoxville. Photo taken by Chris Patriarca (04/03). Interstate 81 north approached the full cloverleaf interchange (Exits 57A/B) with Interstate 181 & U.S. 23. I-181 was truncated southward from Exit 57A in August 2003. Photo taken by Chris Patriarca (04/03). An auxiliary lane accompanied I-81 north from the Fordtown Road on-ramp to I-181 & U.S. 23 south to Johnson City. 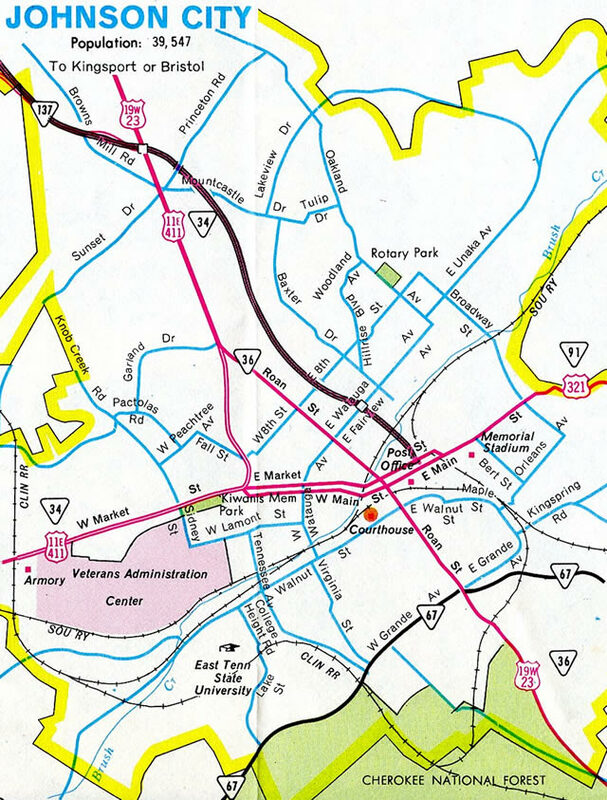 U.S. 23 was the initial route designation given to the north-south freeway linking Kingsport and Johnson City . Photo taken by Chris Patriarca (04/03). Exit 57A departed from Interstate 81 north for I-181 & U.S. 23 south. With the completion of the freeway at Sams Gap, U.S. 23 is cosigned with Interstate 26 southward to the North Carolina line at Rice Bend. Photo taken by Chris Patriarca (04/03). A loop ramp took motorists onto Interstate 181 & U.S. 23 north for the five mile drive to Kingsport. Photo taken by Chris Patriarca (04/03). Interstate 81 southbound approaching I-181 & U.S. 23 prior to the truncation of the route north from Johnson City. Photo taken by Chris Patriarca (04/03). Exit 57B connected motorists with Interstate 181 north nine miles to its end at U.S. 11W in Kingsport. U.S. 23 extended north from the route to the Virginia state line at Morrison City. Photo taken by Chris Patriarca (04/03). Double Springs Ridge rises in the distance as Interstate 81 south reached the off-ramp for Interstate 181 & U.S. 23 north. I-26 would be added to Exit 57A overheads four months later. Photo taken by Chris Patriarca (04/03). Interstate 181 overlapped with U.S. 23 south to Johnson City. U.S. 23 extended southward 81 miles to Asheville, North Carolina. Photo taken by Chris Patriarca (04/03). Leaving the Downtown area of Johnson City, Interstate 181 & U.S. 19W-321 approached U.S. 321 & SR 67 near Roan Hill. The final reassurance marker for I-181 appeared here. Photo taken by Chris Patriarca (04/03). Mile based exit numbers from the U.S. 23 mileage to the North Carolina state line were used along Interstate 181. Exit 31 represented the south end of the spur route. Photo taken by Chris Patriarca (04/03). The first of five Johnson City exits along the U.S. 23 freeway north from Unicoi connected with U.S. 321 & SR 67 east to Elizabethtown. The forthcoming parclo interchange doubled as the south end of Interstate 181. Photo taken by Chris Patriarca (04/03). Crossing Sinking Creek and an adjacent railroad line, U.S. 23 continued to Exit 31 (U.S. 321) and the transition into Interstate 181 north. Photo taken by Chris Patriarca (04/03). Guide sign posted at the northbound on-ramp for Interstate 181 & U.S. 23. The two routes connect U.S. 321 with Downtown Johnson City, one mile to the north. Photo taken by Chris Patriarca (04/03). The establishment of Interstate 26 along the southern half of I-181 was done with piecemeal sign installations at first. Photo taken 08/23/03. U.S. 321 travels west from Elizabethtown as a short freeway to Johnson City. The limited access route concluded at the south end of Interstate 181. Photo taken 08/23/03. "Frist, Alexander, Jenkins applaud new designation of I-26." Press Release, August 2, 2005. "I-181 to become I-26 in Tennessee." News Channel 11 (www.tricities.com), March 1, 2007. Page updated November 29, 2016.